(Vancouver, BC): More and more Canadians are sharing their homes with others through websites like Airbnb.com, Couchsurfing.org, and HomeExchange.com. In fact, over 100,000 Canadian homes are listed on Airbnb.com alone. The city with the most expensive daily rate is Vancouver at $197, followed by Toronto at $160. The city with the cheapest daily rate is Edmonton at $100. 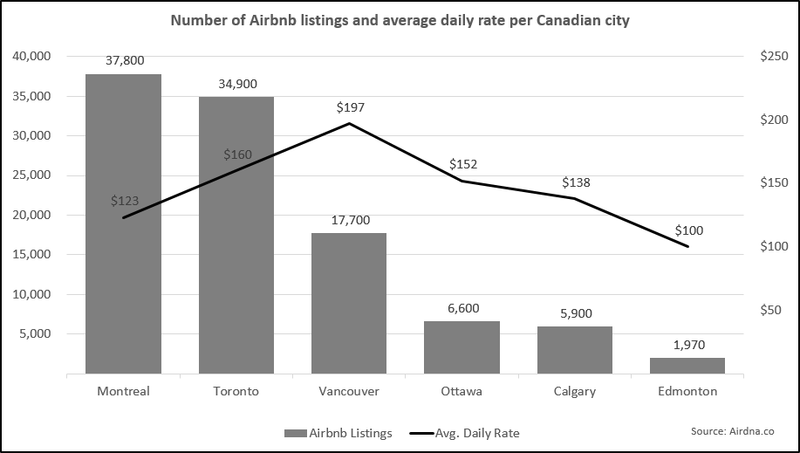 A breakdown of listing counts and daily rates for major cities across Canada is provided below. Square One advises you to speak with your home insurance provider before participating in a home sharing program, hosting a guest in your home, or renting out a room in your home. If you don’t, neither you nor your guest may be covered. From a home insurance perspective, home sharing guests are considered boarders, roomers or tenants. If they steal from you or if things “mysteriously disappear” while they are in your home, most policies will not cover you. Typically, your home insurance policy does not cover loss or damage to the guests’ belongings while in your home. Should something happen to the guests’ belongings, they will need to make a claim against their own home insurance policy. Intentional damage to your home or belongings caused by guests is excluded under most policies. While you can attempt to recover directly from the guest, the reality is that you will likely be out-of-pocket for any repairs. The liability coverage included in your home insurance policy does not extend to the guests. That means if the guests accidentally set fire to your neighbor’s home while using your barbecue, your neighbor will need to sue the guests and attempt to recover from the guests’ home insurance. Some policies require you to have separate entrances for any portion of your home that you rent to others. If you’re simply renting a room (or a couch) in your home, it’s important you speak with your home insurance provider or your entire policy could be void. If you plan on renting out your entire home for a period of time, you may need to switch from a standard home insurance policy to a rental property insurance policy. And, you may want to add coverage for lost rental income due to an insured loss that makes your home uninhabitable. Talk to your home insurance provider to make sure you’re complying with your policy’s terms and conditions. Ask questions to fully understand any policy exclusions that may apply. Properly interview the guests before accepting them into your home. Treat them as you would tenants. Obtain copies of identification, check references, and secure damage deposits. Require guests staying at your home have their own home insurance policies that include personal liability coverage. Get copies of their policies so if something happens, you know where to go. Check with the home sharing service you are using as it may offer some type of “host guarantee”. Read the guarantee’s terms and conditions as it may offer limited protection. As home sharing continues to grow in Canada, it’s important to take steps to protect yourself. To learn more, speak with your insurance provider or call Square One at 1.855.331.6933.